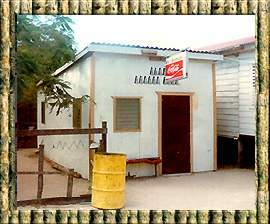 Mrs. Elvia Staines, known as Doña Elvia, is the proud owner of Elvi's Kitchen which has become one of the most popular and distinguished restaurants on Ambergris Caye. With their excellent seafood menu, their great service and wonderful ambience, Elvi's Kitchen has become a favorite among tourists and locals. Mrs. Staines was born in San Pedro and has been living on the island for 66 years. She married Mr. Enrique Staines Sr. and is the proud mother of six children - two men and four women. She has raised them to adulthood and now, together with her daughter Jennie Pinelo, runs the restaurant. She was left a widow after Mr. Staines passed away nine years ago. Elvi's Kitchen started about 25 years ago with a 'hole in the wall' takeout window and Doña Elvia's fondness of the kitchen. "I have always loved to cook," said Doña Elvia. "After cooking for myself, family and friends I decided to open a small takeout restaurant." Doña Elvia explained that she loved to cook all sorts of foods and desserts. She also cooked to help in fundraisers and special community events. This small take-out window which she operated underneath her house was known as Elvi's Burger Isle. The burger isle had a small menu of burgers and fries and frescos. 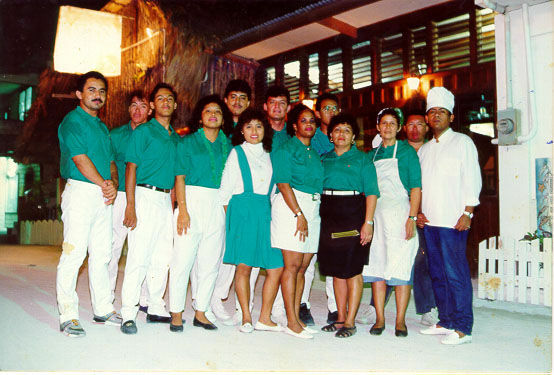 Doña Elvia cooked and managed the kitchen with the help of her husband and three other employees. For about five years, the Burger Isle prepared delicious, finger-licking burgers until Doña Elvia decided to add more food to their menu. Her first addition to the menu was the tasty Belizean rice and beans and gradually she started cooking more local dishes. By now, she had built two palapas underneath the now long-standing flamboyant tree located adjacent to her house. "The Burger Isle was doing good," said Doña Elvia. "I liked what I was doing and decided to expand the place. Now people could stop and have a bite to eat underneath the beautiful tree." Soon after Doña Elvia changed the name of her business to Elvi's Kitchen. The place had slowly grown from a takeout window into a restaurant. The takeout window was closed and the entire area underneath the flamboyant tree was enclosed. Today, Elvi's Kitchen has been registered as a restaurant for twelve years and Doña Elvia explained that a lot of changes have occurred. "It definitely is a lot more work to run the restaurant than it was to run the Burger Isle," she said. "We now have 29 employees who run the kitchen, bar, tend to the tables and work in the office." 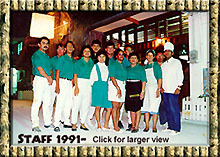 The restaurant has completely changed throughout the years with a complete remodeling of the dining area, the installation of a bar and a lounge and waiting area. 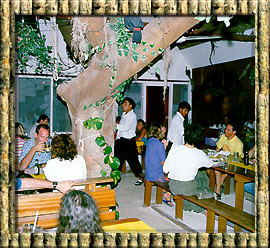 The dining area which is located underneath the famous flamboyant tree provides a cozy and comfortable atmosphere in which to have a relaxing and wonderful dining experience. Elvi's Kitchen has become very popular due to its savory seafood menu which they have specialized in. Elvi's Kitchen has been awarded and recognized for their excellent food, distinct service and notable establishment. Their most recent recognition has placed them in the pages of the Sol y Luna Central American Guide Book as one of the best restaurants in San Pedro and Belize. Doña Elvia has also traveled to Europe to receive an award from the Business Initiative Directors in Europe recognizing them "for immeasurable contributions to the business world for high standings and professionalism demonstrated by prestigious performance." Recognition has also come from the United States and Guatemalan Embassy in Belize and the Civil Aviation and Port Authority of Belize for their excellent service while they were hosted at the restaurant. On November 1996, Mrs. Elvi travelled to Madrid, Spain to receive an award for Elvi's Kitchen, the International Gold Star Award for Quality and Excellence. 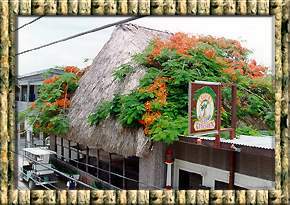 The Mundo Maya Organization has also recognized them for their wonderful establishment and for being the only restaurant in Belize to include a Mayan buffet into their menu and preserving a part of the Mayan culture. Jennie Pinelo, who is the cook, participated in the Cocina Maya Festival in Cozumel, organized by the Mundo Maya, which showcases the delicious and typical food of the Mayan culture. Jennie was picked among many Belizean cooks who applied to participate in the festival. Through USAID, Jennie went to study the culinary arts in Airfield Beach, Florida at the CM Meur Restaurant, an establishment which owns 19 seafood restaurants in the United States. "Just as an example that we are also recognized in the Caribbean, the CHIC Festival in Jamaica invited me to compete in a cooking contest," said Jennie. "This was in 1994, but we had to cover all the expenses and at the time it was too much for us." 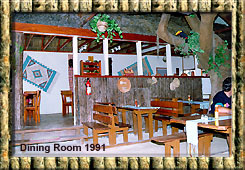 Elvi's Kitchen has certainly proved to be one of the finest restaurants on Ambergris Caye and Belize. They offer exceptional service and food through a family owned business. "It takes a lot of dedication," said Doña Elvia. "You must really like to do it if you want to run the business. A lot of things have changed on the island that one must adapt to. Tourism has surely changed the way of life on this quaint little island. People are a lot busier and always working." During high tourist season, you might encounter a waiting line if you plan to eat at Elvi's Kitchen, especially for dinner. But, the food is definitely worth the wait and you may relax in the lounge area while nursing a cocktail or beverage of your choice. Elvi's Kitchen is also brought to life with live entertainment from local artists on special Caribbean and Mexican Nights. Through a lot of work and dedication, Doña Elvia has proved to be another exceptional entrepreneur in the community. Elvi's Kitchen is the proof of her success. A huge flamboyant tree grows right through the palm thatch roof of the sand floored dining room that was built three years ago. This is the same tree that has been watching the diners at Elvi's for more than twenty years.